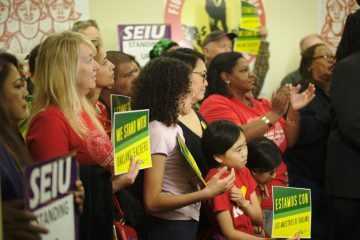 Oakland’s educators voted to ratify a new contract on Sunday, turning the page on the latest chapter in a book of teachers’ strikes across the country. 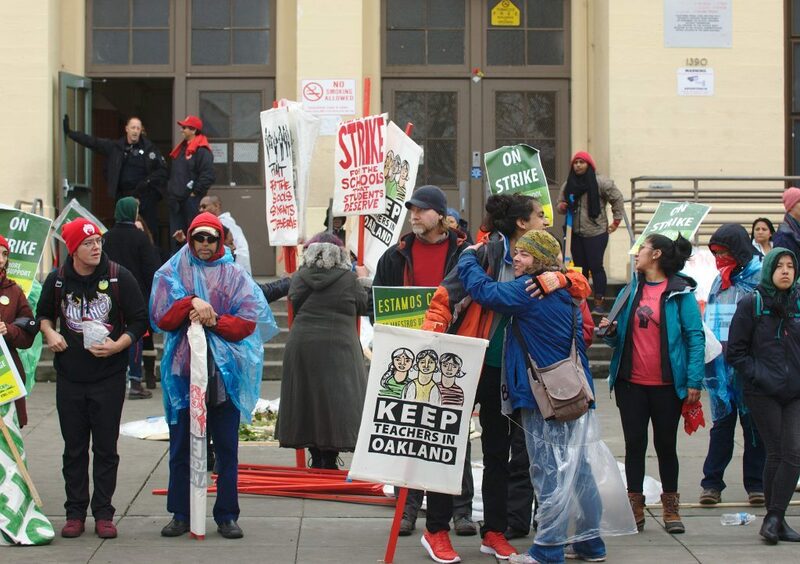 Much of the past week and a half was marked by hot talk in the press, with leadership from the Oakland Education Association accusing the school board of misinformation on multiple occasions, bookended by a physical altercation outside La Escuelita Elementary School. Videos shot Friday surfaced on social media over the weekend showing board president Jumoke Hinton-Hodge, accompanied by former private security firm owner Ron Muhammad, attempting to force her way past union pickets at the building. She could also be seen grabbing kindergarten teacher Darnisha Wright in a chokehold. Members of the board were attempting to meet to vote on slashing the district budget by over $20 million. 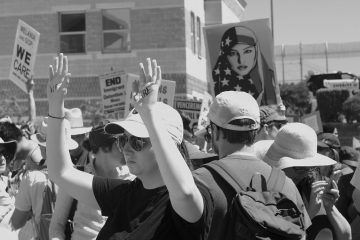 In a separate video, Muhammad, who some called “muscle,” appeared to initiate the confrontation by physically removing several picketers from the doorway. 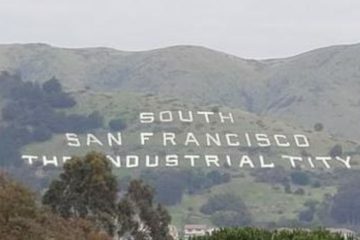 “I would never have intentionally touched another person (or a sister) in that way,” Hinton-Hodge said in a written apology released through her Facebook page and later reprinted by the East Bay Times. But Hinton-Hodge’s statement, which characterized the hold as inadvertent, raised as many questions as it sought to answer, failing to explain why she grinned as her hand was on Wright’s throat. 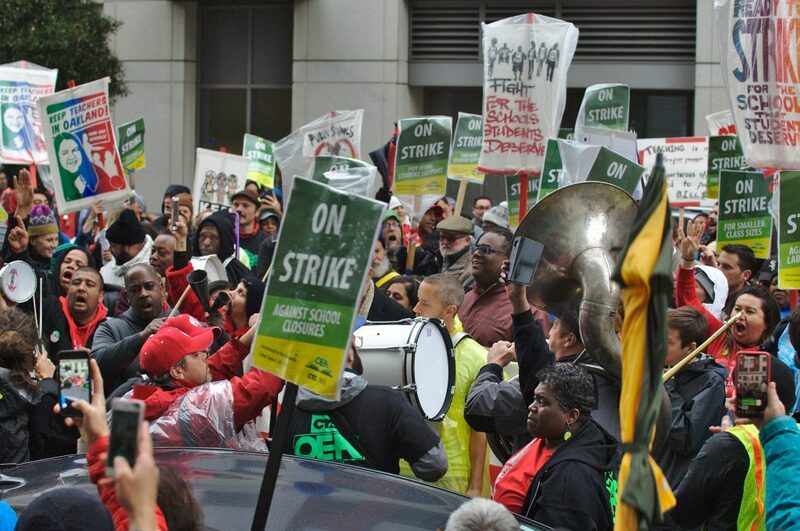 The incidents took place almost simultaneous to the announcement that board and union negotiators had reached a tentative agreement. The seven-day strike was marked by increasing levels of militancy on the part of the union. On Tuesday, as contract negotiations were being overseen by State Superintendent of Public Instruction Tony Thurmond, and held in Assemblyman Rob Bonta’s offices, the union’s bargaining team left the table to join a raucous demonstration outside. 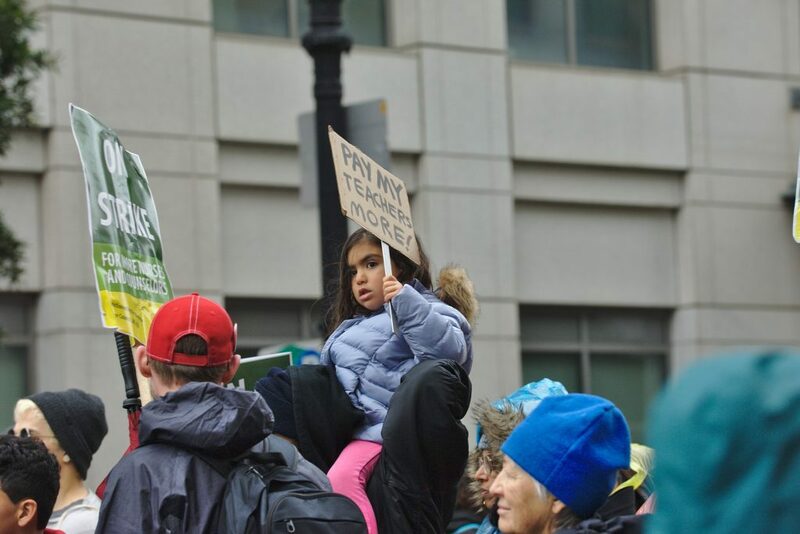 On Wednesday, hundreds of teachers and supporters occupied the Elihu M. Harris State Office building where negotiations were being conducted. After the dust settled over the scrum at La Escuelita and the two sides announced the agreement, union members were given 24 hours to peruse the 100-page agreement before the Sunday afternoon vote. Some union members voiced displeasure, while most of the rank and file appeared to be elated with the deal which contained a one-time bonus of 3 percent, a raise of 11 percent over four years and lower caps on class sizes and psychologist caseloads. The board also agreed to issue a resolution to cap charter school openings and a five-month moratorium on school closures. What neither the board nor the union were able to address was the 800 lb. gorilla sitting on the sofa in the form of state regulations effectively hamstringing public education statewide. School funding in California is tied to property taxes, which are in turn tied to property values. Those property values, per the 1978 ballot measure Proposition 13, cannot be reassessed unless a piece of real estate is sold. This is especially problematic in a city like Oakland, since a good amount of legacy commercial property has not been reassessed any time in the recent past. Several different methods exist for counting students. Some states count the total number of students enrolled at the beginning of the year. Others count students on multiple, fixed dates, typically once in the fall, and again in either the winter or spring. California is among only seven states in the union which uses average daily attendance to tally enrollment. In a poverty stricken district like Oakland, where over 70 percent of students qualify for free or reduced lunches, this method is problematic since low-income students tend to have more difficulty getting to school, which in turn leads to chronic absenteeism. What this means is California ranks either 41st or 46th in the union in per pupil funding, depending on who’s doing the calculating, once the comparable wage index is controlled for. In addition, according to the fact-finding report issued the day before the strike declaration, traditional public schools must deal with “legacy costs” that charter schools do not, creating an uneven playing field. If a school loses 10 first-graders out of 50 to a charter, that doesn’t warrant a school closure. It does, however, mean that it must continue to operate with 20 percent less per pupil funding. Stir into this stew a school board whose last election was heavily influenced by charter money, and the result is the recipe for a hard fought strike. Ultimately, this meant that someone, either the union, the board, or both, wasn’t going to get everything they wanted. 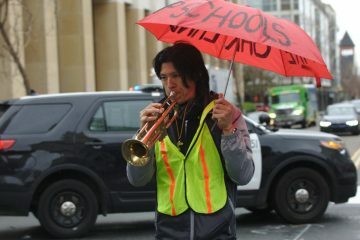 OUSD teacher Joel Wing said the deal wasn’t good enough, pointing to a delayed raise schedule that he said would barely keep up with inflation. In the five years leading up to the 2017-18 school year, the most recent year for which data were available, the number of first- and second-year teachers working in the district climbed by 30 percent, a clear indication of the retention crisis Wing and others are concerned about. Wing also pointed to the lack of commitment to lowering nurse caseloads as problematic. The 1350:1 ratio from the previous contract was preserved, though the new contract provides for a two-time, $10,000 recruitment and retention bonus. Still, a nationwide nursing shortage may puncture any hope the district has of hiring nurses to fill the 12 empty positions it has now, let alone allow for the recruitment of more beyond that number. Despite reservations, union members still approved the contract by a margin of 58-42, even if the voting turnout was 15 percent lower than the initial vote to authorize the strike. None of this managed to dampen the spirits of OEA leadership, however. “When we strike, we win!” read the title of the release announcing the tentative agreement on Friday, all in bold letters. Nevin Long is a writer-reporter, film critic, and East Bay resident since 2009. When he's not slogging it in the rain after a mass demonstration he's writing about, he enjoys spending time with his wife and son, reading contemporary fiction, or kicking back and watching a movie so obscure not even the director's mother has heard of it.